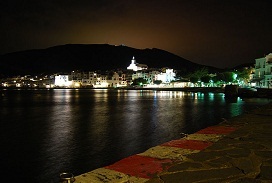 The gulf of Cadaques is situated in the lee of the huge mountains and is flanked by the capes Norfeu and Creus, forming a closed bay, thus offering hospitality and protection when the seldom Mediterranean storms break. The town is particularly beautiful; with fishermen's houses and few hotels and buildings which have been put up to accommodate visitors in the summer. This village, with the sheer white of its houses forming a striking contrast with the dark, was in fact an excellent harbor for shipping, and it still is. This shows that it wasn't built for a settlement. However, it is an ideal spot for relaxation and rest with its beautiful sea and mountain setting. 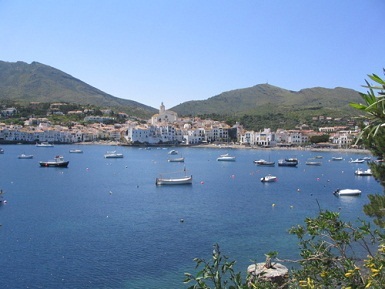 Approaching Cadaques by sea from Norfeu, the bay stretches from Punta de Cala Nana to Punta de S'Oliguera. There is a profusion of indentations in the curve of the bay, forming lots of wonderful small beaches: Sa Conca, Sa Sebolla, El Podritxa, El Llaner, La Platja Gran, Els Guixos, El Poal - and many more. La Platja Gran ("The Large Beach"), at the back of the bay, lies before the oldest part of the town. Heading out of Cadaques up the coast, the first really interesting and worth seeing spot is Portlligat, which is situated very close to Cadaques, just on the other side of the Punta de S'Oliguera. It has an impressive natural harbor with an almost magical quality. The painter Salvador Dali had a studio-home is located here.